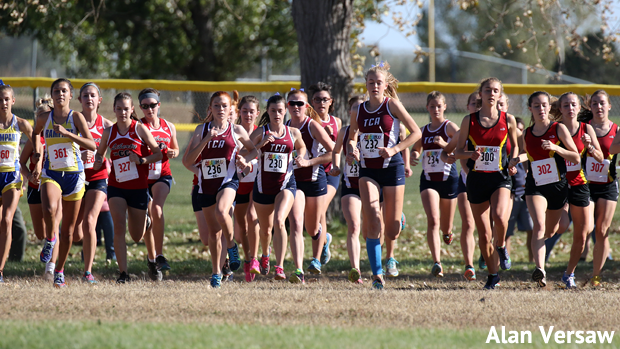 There are a few all soft-surface cross country invitationals in Colorado, but there aren't many. That being the case, they tend to be in high demand. Before I leave here I want to tell you about one more that I'll be helping to host with Fountain-Fort Carson High School. This will be a new version of the FFCHS course; it will replicate certain portions but will not be the same course that has been used in the past. On Saturday, October 6, TCA and Fountain-Fort Carson will be hosting on the campus of Fountain-Fort Carson High School. A few nice advantages attend to hosting there--in addition to the fact that it's possible to lay out a course that's entirely soft surface if only we get a couple relatively short sections of matting to lay across concrete sidewalks. 1. There is abundant parking. The lack of this was always and forever the #1 issue with hosting at Fountain Creek Regional Park. 2. Properly measured, the course should tend to run fast, though it will not be pancake flat. 3. The course is capable of handling at least 20 teams. 4. Since the entire course property is owned by the school district, the cost of the meet will not have to roll in heavy rental fees that are typical of parks and golf courses (when those are even available). DOWNLOAD THE MEET REGISTRATION FORM HERE. Going forward, if you have a new meet option that offers something out of the run-of-the-mill, drop Bobby Reyes an email and it's entirely possible it gets a quick feature here (you might have to supply a usable photo or two, however).